GoPro HERO 3+ Comparison Chart | Which GoPro should you buy? I’m a video buff, photographer and social media enthusiast who loves travelling around the world and the GoPro HERO 3+ ended up being the perfect camera to take with me. Whether I’m taking still shots of the amazing buildings at the destinations I visit or videos of my experiences (the camera is also waterproof and wearable) on both water and dry land, this camera is my best travel companion. 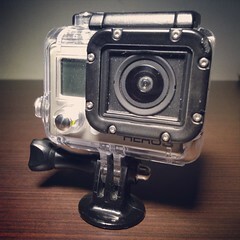 I myself own GoPro’s Hero 3+ Silver Edition, which captures all of my memories perfectly. That being said the Black is an excellent choice professional grade camera with incredible features and the White edition is a solid camera for any skill level, at a lower price, with all the key features. Not only are these camera’s versatile, they’re also lighter and the waterproof casing is smaller than their predecessors, but their weight and size don’t take away from how powerful they are. The Black and Silver editions have Ultra-sharp aspherical glass lens and ultra-wide angle along with reduced distortion. All three Hero 3+ cameras also have built in, faster WiFi, looping video, longer battery life and are compatible with all GoPro accessories. They’re also compatible with the same operating systems, including Mac OS® X 10.5 and up, Microsoft Windows Vista, 7 and up. This is GoPro’s professional grade camera that delivers the highest level image quality that a professional would require and the powerful new features are designed for flexibility and like the other GoPro Hero 3+ cameras, are easy to transport, a huge convenience. The high res, high frame rate video settings up to 4k deliver professional quality footage and enables slow motion with 240fps at WVGA to enable smooth playback. The new. SuperView™ video mode makes it possible for me to capture angle perspectives and the auto low light setting intelligently adjusts the camera’s frame rate, delivering a fantastic, low light performance. The Black edition also comes with a WiFi remote (one of my favourite additions). Basically GoPro’s Black edition is considered professional grade, while the Silver Edition targets consumers who are above average when it comes to everyday, amateur photographers. Some of the differences between the two include the fact that the Silver edition doesn’t come with options like the Black edition’s advanced color settings, Protune mode (delivers high bit rate video) as well as the 24 frames per second recording that is a necessity for professional video production. One consideration for the Black edition, is that the 4k footage at 15fps, is effectively 15 high quality photos per second. This enables you to grab individual frames and use as a high quality photo. GoPro’s Silver edition provides great HD video up to 1080p HD quality along with lots of other recording options, including 120fps WVGA. It’s very similar to the Black edition however you will lose out on several shooting options and a bit of video quality, especially in low light settings. Also, the battery life may be shortened, depending on the features you use. You’ll also need to buy accessories that typically come with the Black edition however, if you don’t care about a bunch of bells and whistles and are just looking for a solid HD video camera, this is still a great option; better than most on the market and is about £70 less than the Black edition. As mentioned above, the Silver edition doesn’t come with the WiFi remote but it does have WiFi that you can use with the remote if you decide to purchase it later. 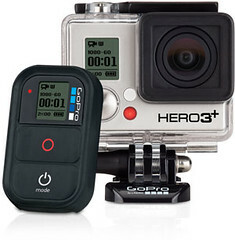 Another option would be connecting it to mobile devices using the GoPro app. I will say that the remote is a handy accessory, but the apps awesome too, and can actually be a bit easier/less complicated to use (more on the app later). Video quality does take a hit because of the change, but exposure and color are still great and the camera adapts efficiently when lighting conditions change. That being said, there is definitely a certain amount of detail loss in comparison to the Black edition. For example, highlights appear to blow out more easily and artifacts are more noticeable, especially video that is viewed at larger sizes. Also not surprising is that the video quality, along with shooting options aren’t the only differences between the Black and Silver editions. One of the main reasons the Silver edition doesn’t do a lot of the things that the other does is that it has different processor and sensor. Bottom line, if you were expecting equivalent video quality between the Black and Silver cameras, that won’t be the case. For average users, the additions missing from the Silver option wouldn’t get used by average consumers anyway. It is important to keep in mind however that this is the company’s midrange camera option and while it’s not unexpected that the video isn’t as good as the GoPro Black edition it’s still a great camera. GoPro’s White Edition is a great little camera that also has built in WiFi, but comes without the remote and other bells and whistles, but like the other editions does work with App. The white edition features enhanced audio and offers video up to HD 1080p, but only at 30fps, so doesn’t allow video to be slowed down as easily. It also captures 5MP photos as high as 3fps. This is a simple, straightforward camera that’s better than most in its price range. 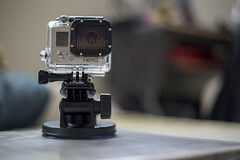 The GoPro app provides the user with a live preview of their shot with only a second or two delay between the camera movement and what’s on the screen. In addition, the app lets you start and stop your recordings, change every camera setting and play and download clips from your GoPro camera onto your device. You can also use the app to remotely control the camera with a tablet or smartphone and play back and social share on applicable social media sites; you can also text or email them. In conclusion, I feel comfortable saying that if you’re considering buying a new camera you should definitely consider a GoPro camera. Whether you’re a professional photographer/videographer, a semi-serious photographer or a beginner, you can’t lose if you invest in either the Black, Silver or White edition camera. If price isn’t a consideration, or you require the Wi-Fi remote, then the Black edition is definitely your best option. The Silver provides the best value for money, whilst retaining lots of features. If you just wish to film for YouTube, then the White edition is a great low cost edition – and would be an excellent choice as a second GoPro.